UK MacRumors: I just paid for breakfast using my Watch. The future is here! Discussion in 'Apple Watch' started by murray, May 1, 2015. Greggs has an app that allows people to buy food and drink at its bakeries, so I topped up my Greggs account with £10, added the Greggs account to Passbook and used my Watch to pay instead of my phone. Feel amazing. Like actually buzzing. Felt a bit nervous as there was a queue of people behind me and I wasn't sure it was going to work, but it did. Oh boy did it work. So now I need to know: What other shops and restaurants over here use Passbook? I know Starbucks does, and Subway uses it for its loyalty points scheme, but who else? Is there a list somewhere? Get Stocard and you can put anything with a barcode in. Yeah see I've tried to use that on my phone, but the damn thing never worked in Sainsbury's (on their quick tills). What stores have you used it in? If I could get that to work I'd be made up. I'm in Wimbledon and have been using my Apple Watch with apple pay at various shops around the village. (I'm American, so I have apple pay setup with my US banks). It's pretty slick, people are loving it. Some tills can be flaky. Tesco and Sainsbury's particularly for some reason. I think it depends on the scanner they have installed, so its a bit of trial and error. I paid for my coffee this way in Starbucks the other day... Worked like a charm! The guy who served me loved it. There was something about holding my wrist out for it to be scanned that felt so... Woah!! Yeah, I need to try out Starbucks too. After this morning's experience, I can't wait for Apple Pay to come out over here. Yeah I would love to know this too. I live in Lincolnshire and Apple Pay only seems to be geared up for big cities in the UK. Just been reminded that Cineworld cinemas also use Passbook for their tickets. 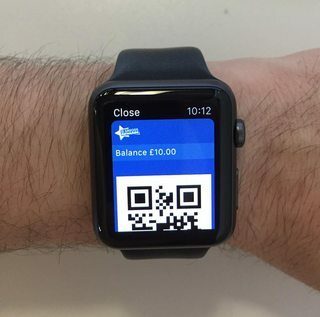 Pay for tickets using the Cineworld app, add that to Passbook and the attendant scans your Watch before you see the film. How is the process of opening this stuff in Passbook on the Apple Watch? Do you have to get it ready? What if the screen goes to sleep? Does it wake back up at the watchface? Thanks for the tip - have set up Starbucks and will give it a go. Hi, I am getting a US Bank card for the same purpose to use in the UK. I wondered if you knew about international transaction fees, I'm assuming that if your bank charges them the you pay them like with any normal debit/credit card transaction? Because I was nervous that it would all get horribly embarrassing, incredibly quickly, I had everything ready to go. I signed up for a Greggs account using their iOS app. I was given the option of adding the Greggs account to Passbook, which I did. I opened the Passbook app on my Watch and tapped the Greggs card. As I was waiting in the queue, the AW screen turned off, so I raised my wrist and it went immediately back to Passbook. I think that that's only because I raised my wrist as soon as the screen went off though. If I had waited a minute before raising my wrist, it would have gone to to the watch face first probably. I gave the lady my order, and asked if I could pay using my Watch. She seemed confused, but I said it's just like paying with the phone app. So I raised my wrist to the scanner, it beeped almost instantly, confirming my purchase, and that was that. You don't even have to do this is it is a location based passbook card (like Starbucks). it will appear in the notification area, just swipe down tap and scan! I live in Lincoln and we are stuck in past haha - rarely see anywhere to use passbook I don't think Starbucks here has the updated terminals to scan phone lol :/ well last time I tried they said they don't have one? That's brilliant. I didn't know about that. Nice summary thanks for the prompt! Have now registered and added Passbook for Greggs, Starbucks and Subway so will have to go put that to use now. Feel the UK is pretty behind in terms of adoption of Passbook though, let's hope Apple Pay doesn't suffer the same fate. Great! Can't wait to try it. Just to note, if you do see the watch face when you raise your wrist (i.e. screen has been off for long enough that it doesn't go back to the app), you can double-tap the digital crown which will take you straight back to the app without having to find it in the app screen. Yes, you will pay a fee if you use a US Bank card to pay in sterling and also you will loose a bit on the exchange rate. That's awesome OP... Nothing like things working. Really doesn't sound like a good idea then! It is just the same as using a UK debit/credit card overseas to pay for things in another currency - there is always a fee!! You are right, it is not really a good idea but useful to have if you are visiting the US because you can use the US card there and not get charged any fees!